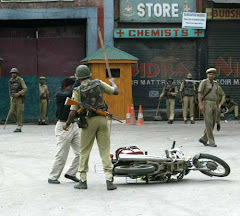 Yet another day of ruthlesshness of Indian security forces has passed in which two innocent civilians have been doomed to death and sixty other injured grieviously and thus continues their brutality and mass murder of Kashmiri muslims. On top of it, they make futile and unsuccessful bids to hack the truth. 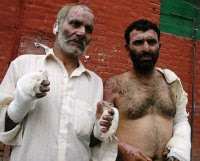 They accuse unarmed protestors of shooting at forces in Shopian and allege peaceful demonstrators of perpetrating violence against security forces. Inspite of all this, some liberal Indians want to lure us Kashmiris with their so-called sound economics, secularism and power. 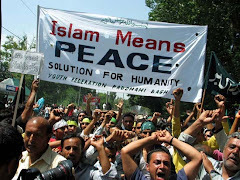 Our reply to them is "TO HELL WITH YOUR ECONOMICS, YOUR SECULARISM, YOUR POWER, YOUR SUPPLIES, YOUR SUPPORT". 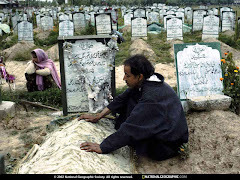 No conscious Kashmiri would ever opt to stay with India after being witness to their brutality and barbarism in the valley. You express your concerns about our survival after freedom. Our reply is you need not worry about that, please leave us alone. 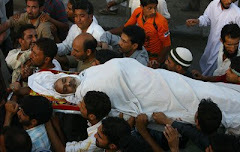 We will prefer to die in harness rather than siding with you beasts who perpetrate most heinous crimes against humanity in Kashmir and the images on the left side of this post are a blatant proof of your avengeful reign of terror that you have unleashed against entire Kashmiri population regardless of their age and gender. 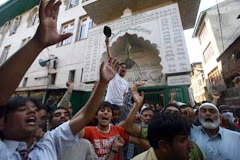 This is the real face of your democracy, your secularism and your liberalism. With all this done, we all say in one voice, "WE WANT FREEDOM", be it at the cost of our lives, our economy, our tourism, our survival. Very soon we will come out alongwith our children, our women and full families on roads and we won't move an inch even if you shower all your bullets on us and we will make sure that every single uniformed terrorist is made to vacate this pious land. We don't want your dirty feet on our soil anymore. Please leave and leave us alone. 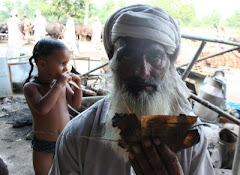 We dont need anything from these ' beggars and snake charmers' as said by British PM churchil. 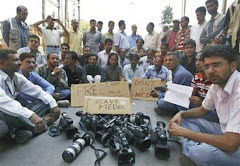 We are not thronging the cities of India to beg.It's Indians who can be found begging in Kashmir. 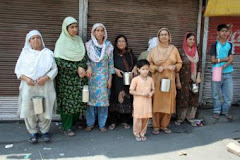 If they cannot be of any benefit to their own people, what good they can do for our Kashmir. We have seen your secularisim ,Your economic support, your oppression ,Brutality from that i'll fated day when traitor maqbool Shervani mis guided our brothers from Muzzaffarabad and you'r savageous army got a chance to land here.Also because of the refusal of the British joint cheif of the Army staff of Pakistan and India to mobilise 2 divisions of Pakistan army in Sialkot and Muzaffarabad sector. Now we will drive you out and Inshallah you'll run like rats.These beasts and their political leaders should be tried in the international court of justice and hanged. Thanks Dr. Waleed for your support. I had posted a comment on Koshur's blog in support of one of your previous mails, but surprisingly my post was not approved and your post too went missing. I don't know why? 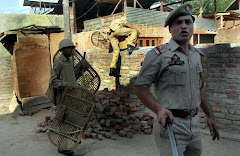 During Amarnath land row, when Kashmiris rightly decried the hidden agenda of then governor of trying to make way for amarnath nagar near the cave site, these apprehensions were rubbished by hindu hardliners as baseless and far from reality. But the real truth has now come to the fore in the BJP meeting at New Delhi where they have candidly revealed their plans of establishing hindu homeland in north-eastern Kashmir including cave site. Full news item published by Daily Greater Kashmir dt Sep., 14th, 2008 is reproduced below which clearly vindicates the dilemmas and predicaments expressed by hapless Kashmiris during land row agitation. Hindu extremists kept denying these hidden plans earlier but now that they have got back the land, they are coming out in open with their dirty gameplan to grab Kashmir. Srinagar, Sept 13: The agenda is out. 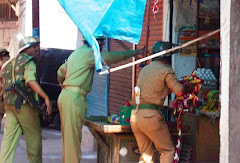 The link between the Amarnath agitation and behind-the-veil Saffron plot is exposed. The Bhartiya Janta Party has demanded nationalization of the entire route to Amarnath cave in the Kashmir valley. In his presidential address to the three-day national executive meeting in Bangalore yesterday, that normally indicates the broad direction of the party policy, BJP president Rajnath Singh demanded the road leading to the Amarnath shrine be nationalized. 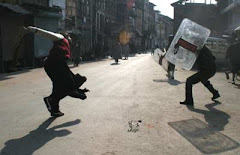 While Rajnath did not elaborate, Panun Kashmir today filled the missing link. “We have already earmarked the area for the creation of a separate Homeland on the north east of river Jhelum. The political map of this area has already been released. This area, which includes Amarnath Shrine, provides vital surface link to the Ladakh region. Creation of Homeland with union territory status in the Valley would secure the territorial and civilizational imperatives of the Indian nation on the northwestern front,” Panun Kashmir said. 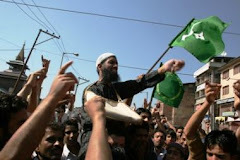 The radical organization claims representing Kashmiri Pandits. 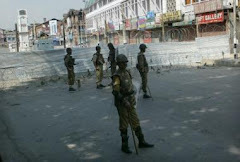 Reports said even some BJP delegates were puzzled by the radical proposal of nationalization of vast areas in Kashmir. 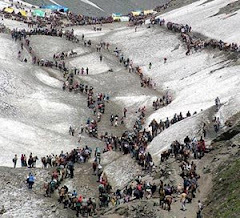 The step is seen as a bid to take the Amaranth yatra out of the purview of the J&K government and put the entire exercise, and the entire route area, under the direct control of New Delhi and the Amarnath Shrine Board. 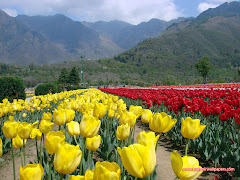 But this suggestion is sure to attract severe reactions in Kashmir as the proposal runs directly in the face of claims that recent Amarnath agitation for land transfer to Shrine Board was only to ensure petty facilities like tents, huts and lavatories for the pilgrims. Sections supporting the land transfer had ridiculed, and even dismissed as laughable, the apprehensions that there was a behind-the-scene plot to establish settlements in Pahalgam and Sonamarg. The BJP has sought to compare the Amarnath issue with the situation prevailing just after the demolition of Babri Masjid in Ayodhya. The BJP president said while the then Congress government had been able to acquire the ‘disputed’ land and end the controversy, the same can be done in Kashmir by nationalization of the entire route to Amarnath cave. The party thinks this will end all the controversies surrounding the annual pilgrimage. 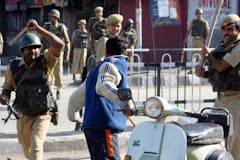 Experts say New Delhi will have to first abrogate or modify, by an Act of Parliament, Article 370 of the Indian Constitution before thinking of any nationalization of land in Kashmir. And here is what reflects how well the BJP has done its homework. Urging all political parties to reconsider the question of abrogation of Article 370, Rajnath said, “Political parties should honestly reflect on this issue.” He suggested that the BJP was going to make this issue an important part of its election manifesto. I think there is something wrong with Kashour.He is not updating anything nor new comments are cooming in his blog. I hope all is well with him. 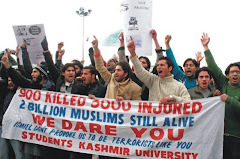 Ya I indeed read about the plans of dividing Kashmir valley into Hindu part and muslim part.Fanatic Panun Kashmir has long before hatched this conspiracy.The recent visit of notorious Israeili army cheif is an indicator of building of settlements in Kashmir same like Palestine.for 300.000 kashmiri Hindus they want to dive it in half.Indeed this will be resisted with tooth and nail.I was reading one comment about your blog getting hacked.Who is doing it? I think the Indian agencies ! who else. 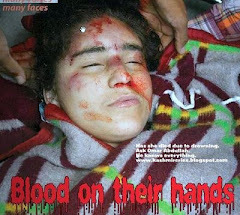 they will be having sleepless nights as our blogs expose their brutality and oppression against Kashmiri people. 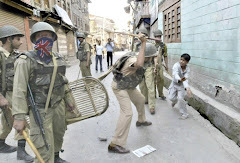 Srinagar, Sep 13: To prevent his mother from lathis of the paramilitary CRPF troopers who were thrashing her at the Amira Kadal bridge Saturday, 12-year-old Biscoe Boy, Pirzada Inayat braved to act a shield on her while the troopers kept flexing their muscles. But as the little boy in shorts tried to resist, he got injured more. 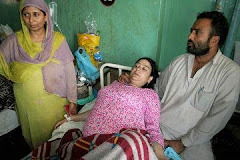 “I kept shouting for help towards the JKP cops standing nearby but no one came to our rescue,” says wounded Fahmeeda as Inayat having apparent injuries on his ribs was rushed to hospital. 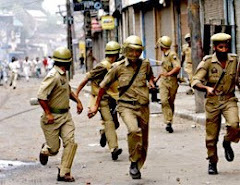 The mother had just picked his only son from nearby Biscoe School when they were trapped by the troopers on the deserted bridge soon after teargas shelling in the area. Fahmeeda says a group of dozen odd men in uniform cornered her and started thrashing her with lathis and she fell on the ground. 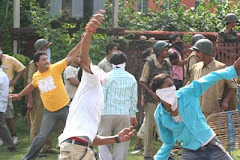 The 6th standard student jumped on his mother to shield her. 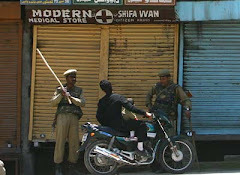 “But they (CRPF personnel) didn’t stop and started beating him the same way. I cried for help and tried to save my son,” she added. Finally the mother-son duo managed to get out of the clutches of the troopers when some civilians approached for rescue. 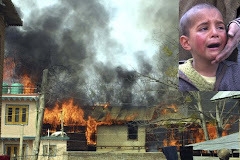 “What had my innocent child done to you?” she shouted as some armed troopers kept watching her from the bunker and Inayat was being treated at the Bone & Joint Hospital, Barzulla. 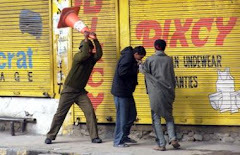 Dear kashmir on the boil.